2.1. WHAT IS CHANGED PER CREATURE? - added angular damping to humans. I wanted them to look like they are giving some resistance to falling. They will still fall at the normal speed if thrown from heights. Please leave the opinion in the comment section about it. - added a bit more of angular damping to larger animals and mutants: Brahmins, Super Mutants, Deathclaws. This is overhaul of, probably, all ragdoll (corpses) that are used in the game. hill. Ragdolls will now roll as they should. usually don't bounce around. Also, according to Nifskope, disabling bounciness should slightly increase performance as it's one less parameter for CPU to worry about. LIMB MOVEMENT: Almost all ragdolls, especially humanoid ones, have improved range at which limbs can move, which results in more realistic corpse behaviour and more satisfying kills. PLAYER COLLISION: Now you cannot simply walk through the corpses as the player and all other creatures will collide with ragdolls. You can also climb on them. FIXES: Some ragdolls required some minor fixing to be done, because either collision boxes, values were wrong, limbs were bending in the wrong direction or wrong materials were used. I tried to fix to the best of my knowledge. WEIGHT: Increased for the most part and reduced for some ragdolls. Some corpses (for example, Bloatflies) were too heavy to be lifted or some were too light for their size. If you need to move a corpse, I suggest to grab it by legs, arms, head...anything other than torso. but grabbing corpse to any other limb will move it normally. using bloody mess perk. Other parts of the body will blow up as they should when using it. Gonna try to find a way to fix it. There's some serious problems with skeleton that Tracker and Bruiser use. If I edit it in any way and save it, it will cause game to crash. 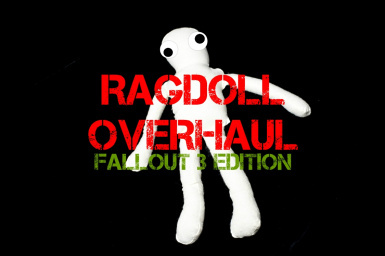 So, for now there will be no edited ragdolls for Point Lookout until I find a solution for that problem. difficult for inexperienced user. Manual installation is highly discouraged. installation, click "Activate mod" and also click "Yes to all" if prompted to overwrite something. Click on "Deactivate mod" using Nexus Mod Manager or Fallout Mod Manager. If you use custom skeleton, like ones that add bouncing body parts, skeleton (ragdoll) included in this mod will overwrite custom skeleton. I suggest you backup your custom skeleton and then copy it over skeleton included in this mod, but you will not benefit from changes made to human ragdoll. All other custom bodies (male or female) that doesn't have custom skeleton will work normally. Nifskope - I've made 90% of work using it. Bethesda - For making an awesome game. If you like it, endorse it!